This may be a tricky hitch, as the trail crosses a very quiet road. Certainly many hikers go into Trout Lake, but you may have to wait awhile for a hitch. Once you get into town, you have the benefits of a tiny town where everything is contained in just one block, so there isn’t any needless walking. The general store is the place to hang out. There are picnic tables outside the store which are a good place to park yourself for a bit. Laundry can also be done at the store as well. They also have a large yard which we took advantage of to dry out all of our gear after a very rainy day. The Bear Creek Cafe was just down the block (and the only place to eat when we passed through). Our experience there was mixed…the prices were high and the portions small, but their huckleberry-filled desserts were very tasty. Going fast: If you don’t mind carrying food for almost 150 miles, then skip it. Otherwise, head in and enjoy some town comforts before heading back to the trail. Moderate pace: Hitch into town and make a day of relaxing and eating before heading back to the trail. The Kracker Barrel convenience store felt like such a refuge after several rainy and cold days. We hadn’t really given much consideration to where we were going to sleep that night, but then we found out that one could rent the tiny ski condos next door and we were all for it. They were really small, but cute and comfortable. There was even a small kitchen, so if you bought something at the Kracker Barrel or found some food in the hiker box, you could cook it up in the kitchen. The Kracker Barrel has limited options for resupply, but could work in a pinch. You can also do laundry at the store. Going fast: Pick up a resupply box, eat a few snacks or get a hot drink and then head back to the trail. Moderate pace: Pick up a resupply box and stay at the ski condos for the night. While there isn’t a big town here, there is a comfortable motel (Summit Inn) and several good restaurant options within a 1/4 mile of the motel. There is even a restaurant in the motel, so if you really want to conserve your energy, you just need to walk down the hall for food. 🙂 Snoqualmie Pass is actually a pretty nice place for a zero day and we took zero days there both trips. There is a Chevron next to the motel, where you can pick up snacks, and probably resupply in a pinch. Going fast: Pick up a resupply box, have a meal and then head back to the trail. Moderate pace: Pick up a resupply box, eat lots of food, stay in the motel and consider extending your stay for a zero day. If you are sending yourself a resupply box, then you can go ahead and send it to Stevens Pass Resort, so that you don’t need to worry about hitching to Skykomish. However, if you feel like you need to get out of some bad weather, or just want a break in town, then by all means, head down the mountain to Skykomish. In 2012, Beardoh stayed in Skykomish at the Cascadia Inn which was very comfortable. The cafe in the restaurant has pretty limited hours, but there is a deli in a gas station not too far from the motel if you need some more food. When we passed through together in 2016, we just stayed at Stevens Pass and camped near the resort. We made it to the resort early enough in the day to be able to get sandwiches before they closed, but just ate out of the hiker box for dinner. Fast pace: Pick up resupply box at Stevens Pass, get something to eat at the resort cafe and then keep walking. Moderate pace: If you need a break from the weather, then hitch into Skykomish and stay at a motel for the night. Otherwise, you can pick up a resupply package at Stevens Pass, enjoy some food at the resort cafe, relax for the evening and then camp nearby. 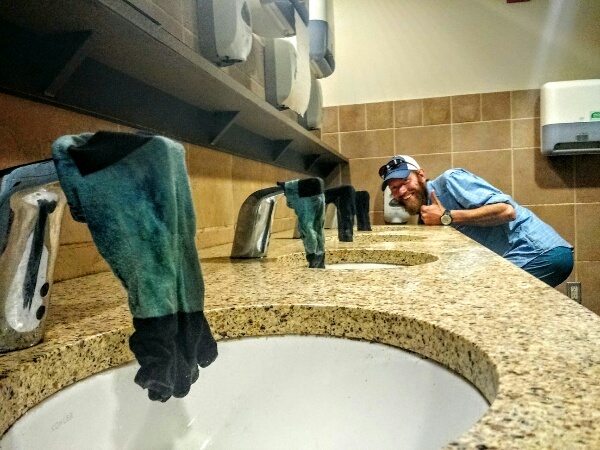 MountainMan getting fancy with his laundry at the Stevens Pass Resort. Stehekin is really a unique town experience along the trail. A town with no road access, Stehekin is like a gem hidden away at the tip of Lake Chelan. Of course, there is the famous bakery, which many hikers enjoy, but the charm of the village is felt all over. There is a lodge with not a lot of rooms, so if you are able to get one (yep, they aren’t the cheapest lodging on the trail), consider yourself lucky. There is also free camping through the National Park…you just need to stop into their office near the dock and request a camp spot. If all the designated camp spots are taken, they will still accommodate you in the overflow area. There is a restaurant near the lodge, and a great porch to hang out on and enjoy the views of the lake. If you feel adventurous, you can rent a bike and have easier access to the bakery (or other sites) which is about a mile away from the main area of the village. The post office here is tiny, and they are very used to having the post office filled with hiker boxes during the summer and fall. The trail is about 11 miles from town, so you need to schedule your timing to coincide with one of the shuttle pick up times. The last time we were through, there were four pick up times per day. Going fast: Don’t miss out on the Stehekin experience, so take the shuttle in, pick up your package, and spend the day in town. Camp in the park and take the morning shuttle back to the trail. Moderate pace: Pick up your resupply package, enjoy some town food and relax in the beautiful setting. Consider hanging out for the first part of the next day and taking an afternoon shuttle back to the trail. If you are going to do this, you will want to get camping permits from the National Park office near the dock. 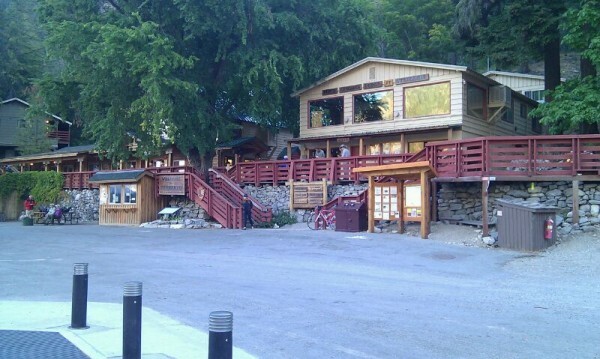 This photo pretty much shows all of “downtown” Stehekin! We only know of one pair over the years who has gone into Mazama for resupply, and they really loved their time there. However, almost all hikers go into Stehekin, so there isn’t any reason to also go into Mazama. Moderate pace: Skip it, unless you didn’t go into Stehekin.